A rare display of class resentment on TV this week - on Hugh Fearnley-Whittingstall's Chicken Run programmes on Channel 4. The programmes were enthralling not because of their ostensible topic - the welfare of chickens in intensive farming - but because of their running subtext of class antagonism. The ambivalent role of old school liberalism was to have at least allowed class into its reality picture, as a kind of blind spot that is acknowledged by the very conspicuousness of its repression. So it was here, where a kind of Fourieresque paternalist liberalism confronted one of the effects of (the of course un-named and unidentified) neo-liberalism's anti-paternalism. Fearnley-Whittingstall's aim to transform his local town, Axminster, into 'Britain's first free-range chicken town' was dogged by a single mother, Hayley, who, although she had enthusiastically participated in a project which saw residents of council estate raise and kill their own chickens, resolutely refused to stop buying '2 for £5' chickens in Tesco. Even after she saw how chickens were kept on the intensive chicken factory that Fearnley-Whittingstall had set up to demonstrate the conditions that cheap chicken are raised in (none of the intensive poultry producers would allow him to film in their establishments), she maintained that feeding her children on a limited budget was more important than the welfare of chickens. There was something heroic about the way in which she resisted the consensual sentimentality to which the others on her estate - cast in Fearnley-Whittingstall's narrative as, if not noble savages, then easily ennobled 'common people' - seemed to quickly submit. 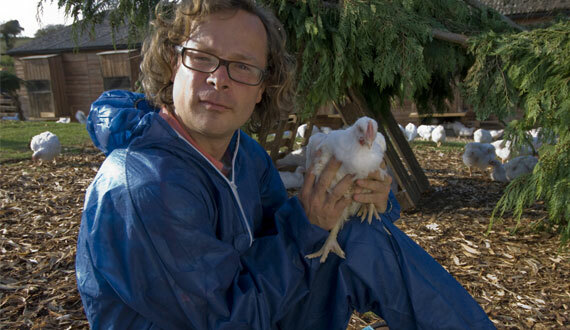 On BBC1's painfully Partridgesque One Show, Fearnley-Whittingstall said that he didn't want to 'flinch' from the issues that Hayley raised , but that chicken welfare was 'not about class but ethics.' The immediate temptation here is to indignantly ask if class is not also about ethics, but this should be resisted, since Marx's claim that 'ethics' is a mystificatory bourgeois category has never had more purchase than now, when 'the ethical' blatantly serves as both a substitution for, and a means of warding off, the political-economic. 'Ethical consumerism' is posited as the (only) means by which people can 'make a difference', but of course consumers cannot make one jot of difference to the systemic causes of misery (in humans or chickens), they can only make a 'choice', where 'choice' - divested of any existentialist charge - carries the meaning assigned none to it by neo-liberalism. Choice, in this rendition, is, (second) naturally, a choice between commodities. Like neo-liberalism itself, ethical consumerism presupposes the Smithian invisible hand even as it accepts that it occasionally needs jogging in the right direction by enlightened 'good sorts'. In 'Transformations of the Image in Postmodernity', Jameson warned of the depoliticizing function that the return of ethics plays in the stablising of the capitalist reality picture. 'For ethics,' Jameson writes in ', 'is irredeemably locked into the categories of the individual, when not in fact of individualism as such: the situations in which it seemed to hold sway are necessarily those of homogenous relations within a single class. But only those whose thinking has been irreperably damaged by empiricism can imagine that to pronounce the end of ethics (beyond good and evil!) is tantamount to recommending wholesale violence and the Dostoyevskyan "anything goes", rather than a sober historical judgment on the inadequacy of certain mental categories.' The current capturing (and attempted depoliticization) of Green issues by the capitalist Matrix - and the attendant emphasis on lifestyle and health - is an exemplary demonstration of Zizek's Lacanian reversal of Ivan Karamazov's 'if there is no God, everything is permitted': everything is permited, on the grounds that it is deprived that which made it enjoyable. But, as I've argued before, it is imperative to reject Zizek's Oedipal Catholicism (something is enjoyable because it is forbidden), which is only the dialectical complement of today's hedonic conservatism, or ascetic consumerism. Hastily festooned with Green and Fair Trade slogans, the Capitalist Matrix looks like a bad synthesis of the two worlds in Ursula Le Guin's The Dispossessed - the one, earnest, communal-orientated and austere; the other, pleasure-driven, intoxicating and intoxicated, slick but sick. There's something queasily appalling about being sold moralism with your M and S pornfood. Needless to say, neo-liberal Britain has more than been 'damaged by empiricism', to recall Jameson's phrase. Fearnley-Whittingstall's programme, like Jamie Oliver's upcoming programme tonight, and the absurdly sensation-mongering-mawkish-moralising 'Kill It, Cook It, Eat It' on BBC Three (a programme so breathtakingly Brass Eye-like that it makes parody obsolete), claim that it is making people 'experience' the 'reality' of meat production. But that 'reality' is not available to experience, only to cognition. The crowding of animals into tiny spaces - and its complement the economic inequality that means that many can only afford cheap meat - is of course an epiphenomenon or a symptom, not the structural cause or Thing itself, Capital, which is far too abstract to be experienced as such. Fearnley-Whittingstall exemplifies that combination of charm and bullish certainty which is characteristic of the English Master Class at their most winning and and their most irritating. Describing himself on the One Show as 'a posh boy with a farm' Fearnley-Whittingstall is more ingenuousness about his class background than Jamie Oliver, which meant that the resistance and class resentment his 'Chicken Out' campaign faced was different to that encountered by Oliver when he took on the problem of school dinners a few years back. Oliver was famously resisted by parents who passed fast food through the fences of schools that had converted to more nourishing meals, but whether this was an act of class defiance to bourgeois do-gooding or an act of entrepreneurialism, or some combination of both, was unclear. In Fearnley-Whittingstall's programmes this week, the class aporia was insistent. The programmes devoted quite a bit of screen time to Axminster working class voices that were sceptical of his motives and openly hostile to his 'organic' and 'free range' agenda, which they rightly saw in class terms. To many, myself included, the 'organic' and 'ethical' labelling of products produces a smart of resentment; this is expensive posh food, and our being hectored to purchase it is another example of the middle class lecturing the poor on how to behave, one more consequence of the 'ethicization' - or depoliticization - of postmodern British life. The abstract contours of global Capital, and its handmaiden, neoliberalism, necessarily appear in Fearnley-Whittingstall's and Oliver's vision only negatively, or rather in an inverted way, the elephant in their farms, seen from the wrong end of the telescope, from the consumer's point of view. It would only take a nudge - albeit a massive political ontological leap - for the condition of chickens to be connected with the superbugs raging through privatized hospitals, with the mental health plagues and with the homicidal youth violence that stalks former public spaces. But what these campaigns demonstrate is the continuing power of television and of paternalism, albeit of a liberal stripe. One positive side-effect of Fearnley-Whittingstall's chicken run campaign was the fostering of a a collective project. 'There's nothing else round here,' one participant glumly noted. One can only speculate what a collectivist, as opposed to a liberal, 'paternalism' - we still await the proper de-familialized and de-patriarchised term - might achieve.